Are you ready for a week full of Seussness? TheMailbox.com has ideas to share. Provides ideas both day and night. More than 100 to be exact. That’s not fiction, just pure fact! So check it out right away. There is no reason to delay! But wait, I have a song for you. I’ve added a verse and you can too! Sing it loud and sing it clear. Your audience is sure to cheer! Read, read, read a book. We read all the time. We love books by Dr. Seuss. We love the way they rhyme. The naughty cat makes such a mess! So many feet to meet. Green Eggs and Ham with Sam-I-Am. PS: My verse is in blue. What’s yours? 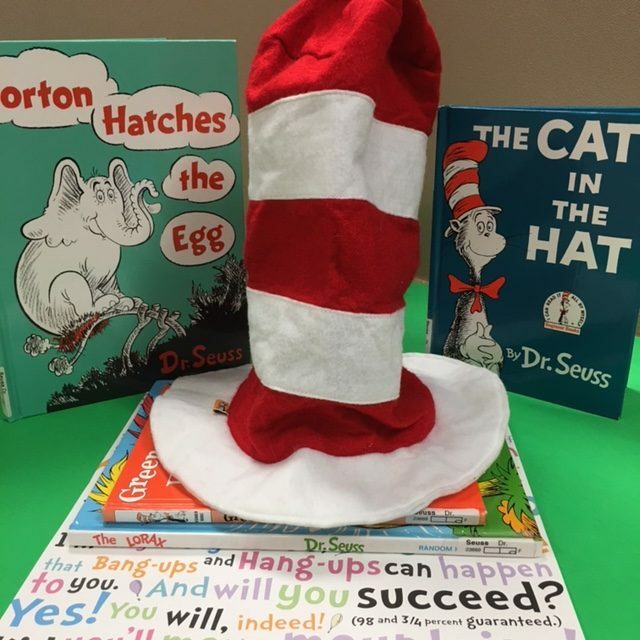 Starting my Seuss-abulous week with read aloud to tiny tots on Tuesday (birth to 4 yrs old) and ending the week reading to 1st then 3rd graders. Love, love, love your verse, Brenda! Have a great “Seuss-abulous” week! It’s fun visiting new places. Learning things you didn’t Know. Mr McCabe our Principal at Columbus School read this book every year to our Eighth Grade Graduation Class.